THE American company set to seize control of three Camden doctor surgeries could be eyeing up even more key health contracts in a bit-by-bit takeover of the borough’s services. This is the stark warning from campaigners who have urged all patients and doctors in Camden, not just those involved in the current takeover of GP practices in the south of the borough, to get involved in a mass protest. The message is clear: Stop UnitedHealth now – or your surgery could be next. The company, the British arm of the largest healthcare provider in the United States, has been handed control of the Brunswick Medical Centre in Bloomsbury, the Camden Road Surgery, Camden Town and the King’s Cross Road Surgery. So fierce is the objection to the move, patients and doctors passed a vote of no confidence in the Camden Primary Care Trust board, which awarded the contract – the clearest message that faith in their ability to give the public what they want has sunk to a new low. The main concern centres on a fear that UnitedHealth’s operations will be driven by profits and a natural desire to please shareholders. Dr Paddy Glackin, chairman of Camden’s Local Medical Committee, warned on Tuesday that the controversy might not end there. He said Camden had been singled almost as a guinea-pig case to test the water. He was speaking at a campaign meeting for objectors to the contract award. Around 200 doctors and patients turned up at the main chamber in Camden’s Town Hall and raised their arms defiantly to back the no-confidence vote. It is not clear whether the final contracts for the three surgeries have been signed amid the huge public objections. Barbara Saunders, a patient at the Brunswick, has hired a legal team which has already fired a warning shot that the issue might have to be decided in the High Court and a judicial review. She said: “I don’t feel I was consulted about it at all. But if the legal challenge is batted away, objectors believe they need a plan B, and possibly even a plan C, D, and E.
The fightback will continue with a march on the Department of Health’s office on Monday night. Other suggestions have included 1960s style sit-ins and a picketing of UnitedHealth’s offices. He told the meeting that he has asked the PCT whether it had known about fraud investigations into UnitedHealth’s operations in the United States when it agreed to hand over the Camden contacts, likely to net the company around £1 million a year in profits. He said there was a sea change in government policy in the United States which had seen presidential candidates promising reforms – a shift which had seen healthcare companies searching for other areas in the world to operate in. The PCT, which insists it followed a rigorous appointments procedure and has confidence in UnitedHealth, is now facing one of its strongest challenges. There is a plan to lobby every single member of the board. Senior figures at UnitedHealth will also be watching protests carefully. The company has already said it will keep some doctors on and expand services, increasing opening hours and making it easier to see GPs. But not in recent memory has a PCT board decision been met with such an outcry in Camden. 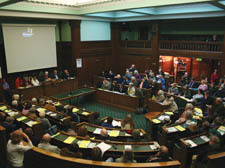 Backbench councillors from all parties are expected to meet next week to see whether they can refer the issue to health secretary Alan Johnson given the level of dissatisfaction – albeit with mutterings growing louder on a political point-scoring level as to why the Town Hall did not make a deeper investigation into the process earlier on. • Objectors to the takeover will be protesting outside the Department of Health on Monday at 5.30pm.